Eyesight is often the first thing to go as we age, but by the time we need them we may just have robotic eyes. 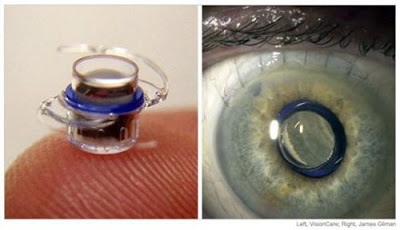 VisionCare Ophthalmic Technologies has now had its implantable miniature telescope approved by the FDA. It’s designed for patients over 75 years old, who are suffering from end-stage macular degeneration. It magnifies and projects images onto a healthy portion of the retina. The downside is that it can only be used in one eye, since the other eye is needed for your peripheral vision, which you wouldn’t want to be without. A full 75 percent of over 200 patients had their vision improve from severe problems to moderate problems. It costs $15,000, but hopefully you will never need it.